Home » Book Reviews » Oh Barna, you’ve done it again! Oh Barna, you’ve done it again! My two favorite subjects at College were ‘theology’ and ‘Church history’, because I love to see the outworking of the theology of the time. The Reformation saw the Church being ‘born again’ or ‘saved’ from the dark ages through the restored message of justification by faith, according to scholar Jack Hayford. The doctrine of salvation was rediscovered. Hayford believes the 20th century was the ‘century of the Holy Spirit’, and says this century birthed the reformation of ‘ecclesiology’ the doctrine of the Church. 100 years from now, what will Church history say about the theology of today? One man who has thrown his considerable hat into the ring to answer this question is US researcher George Barna. The reaction to his book Revolution is massive. Some have labeled the movement he describes as the ‘tune in, drop out’ reformation of the western world Church. I think that’s a little unfair. Barna calls Christians to move beyond the established Church and instead be the Church. He doesn’t advocate abandoning the Church – just redefining it. He suggests we’re witnessing the fall of the local Church (as we know it) in society. What’s this new reformation/revolution all about? Is it an excuse to skip Church? What is the theology behind it? Will it have a lasting impact? Modern pastoral training focuses on care for believers and organisational success. Pastors are equipped to be ‘ministers’ as opposed to ‘ministers of the gospel’. But what happens when we become all-consumed by the saved flock? The majority of Church growth comes from Church shoppers and hoppers, not conversions. Attendance drops off, tithing becomes increasingly cause-oriented rather than a spiritual discipline. Leadership positions become harder to fill. Faced with this situation, how are Churches responding? Sadly, some respond to a lack of leaders by lowering the requirements to become a leader, which in turn de-values the ministry and decreases its effectiveness. However, the opposite action produces a better outcome. Instead of watering down requirements for ministry, raise the bar. Tell people it’s not about them, it’s about Jesus! He is worth the best you have to offer! Jesus said, ‘If I be lifted up, I will draw all men’. Barna’s critics have got it wrong. At the very core of this new reformation is not the ‘tune in, drop out’ ethos, it is in fact ‘He is worth it’. Jesus is worth going it alone, He is worth stepping out in faith, He is worth the risk. Even if all the steps aren’t in place, even if you aren’t sure it is going to work, take the risk. The new reformation already looks like it will be expressed in risk taking! This fact alone will place an increasing need for Church leaders to be early adopters. Ministries will emerge which, at the surface level, seem to have nothing to do with Church or even God for that matter. But all the way through them is an underlying principle of mission. Mission will be paramount, even if unseen. How so? The Church will come alive to the process of evangelism. Evangelism will no longer just be seen as an event. This reformation will view successful evangelism as moving people along in the process from wherever they are through to a relationship with Jesus which produces much fruit. This view of evangelism as a process can be extremely liberating and rewarding to many Christians. Some years ago, a youth leader came to me in tears, upset that despite her many years in ministry she had never led a single person to Christ. I was shocked! Not that she hadn’t led anyone to Christ (because I know many pastors who haven’t either!) but because this lady understood what we were on about! I told her she was extremely successful in evangelism. All I had to do as a pastor/evangelist was follow her around. She had the ability to get people to the point of committing their life to Christ and I simply reaped the harvest she had planted. For the first time she saw her role in the body of Christ. She was released to do what she did best, prepare people for someone like myself who will reap the harvest! On a larger scale, ministries become far more inter-related, because the priority or core purpose of each ministry is to continue moving people through the process of evangelism. Sunday services become more a reflection and celebration of what God is doing within the community. Services will provide an opportunity to communicate what each ministry group is doing, so people know how they can move lost loved ones along in the process. 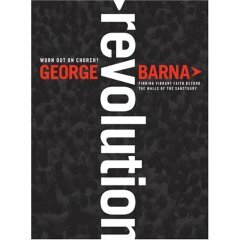 Barna has also been criticized because some believe his new book is without his usual facts and figures. You might well ask is it a whole lot of wishful thinking? The conclusion is simply, yes and no. Yes, there is some wishful thinking involved, it wouldn’t be a revolution otherwise! And no, it’s not all conjecture, because we’re seeing the evidence of this revolution before our very eyes. In fact I saw it last night in the faces of two guys I am mentoring. The whole idea of Church and how it is worked out in the form of gatherings and ministries is changing rapidly for them. They will be new cultural leaders and transformers within my Church. The revolution is exploding, taking on a life which, in many ways, seems uncontrollable! Do I have facts and figures to support it, well yes, but only for my congregation. Does Barna have the facts and figures to support it? I’m not sure, but what I do find interesting is those who last week used Barna’s statistics to prove their own agendas are now the ones attacking him. It’s hard going for this new reformation because we’ve all sorts of people jumping on board ‘apostolics, fundatmentalists, penetcostals, emergents’ all laying some claim to it, all with preconceived ideas. The danger is the reformation could explode into factions at any time. Nothing outside the Church can stop it. The only thing which can hinder it is us is ourselves. Here on the Sunshine Coast, we’re about to embark into unknown terrain series of extreme youth events planned and implemented by a gathering of youth workers from different Church and para-Church organizations. These events will be enveloped in prayer, carefully targeted, and will aim at moving young people one step along in the evangelism process, with the ultimate goal of helping them belong to a community of faith and become a revolutionary Christ-follower. Lastly, let me say this. The revolution is far greater, far nobler than simply ‘tune in and drop out’. It is more like ‘come alive and thrive’. The battle lines are drawn. Barna has nailed his colours to the wall, and whether or not you agree with him, you have to admire his honesty and courage. Our world needs us to take a risk right now, so join the cause!